Owen doubles down the third baseline, driving in his fourth RBI of the day. 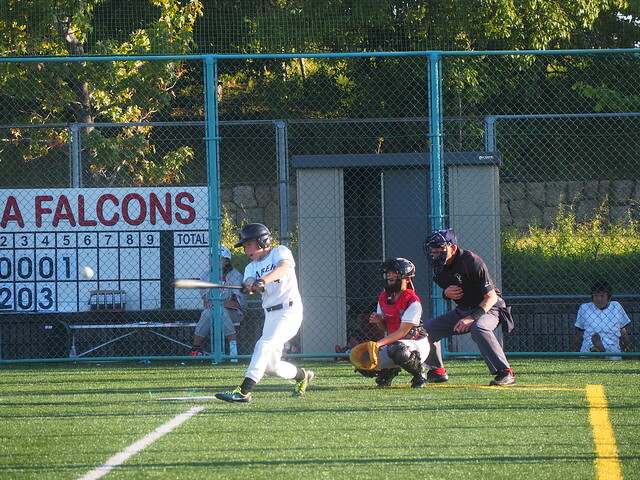 Owen’s team completed the perfect season yesterday with a 12-2 win over Canadian Academy in the finals of the Western Japan Athletic Association middle school baseball championship. Also participating in the the two-day tournament were Sons of Light Christian School, Nagoya International School and Marist Brothers International School of Kobe. 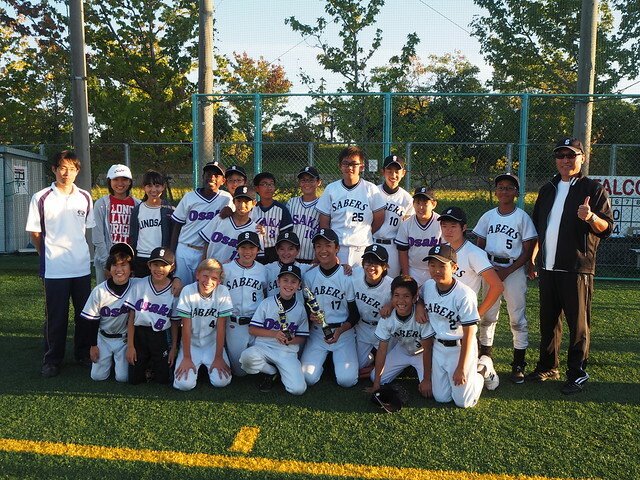 The Senri and Osaka International Schools Sabers went undefeated this year, including 5 wins this weekend. 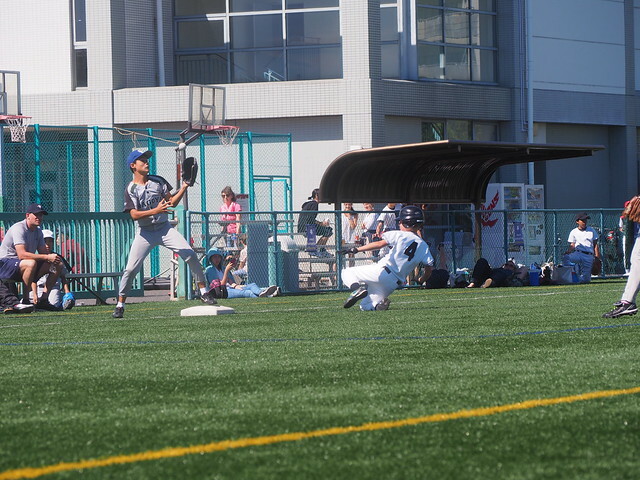 Owen slides into third base against Nagoya IS. Owen was the offensive star of the game. In the fourth inning in a 2-2 tied game and two outs with the bases loaded, Owen hammered the 1-0 pitch to the wall in right center and made it to third with a triple. The 3 RBIs blew open a tight game and the team went on to score 7 more runs in the last three innings. The pitcher for CA was the son of former MLB player, So Taguchi. He also had a ground rule double and another double (photo above). He walked and struck out in his other two at bats. MVP Keito Sasaki completed his middle school career with the complete game win. Owen played center field for both games today. He has played third base, first base and pitcher this season. He was much more comfortable playing as the season progressed. I saw him develop confidence in his abilities and begin to enjoy the sport. I hope he continues to play and has an even better season next year! Here is the article about the tourney from the SOIS website. 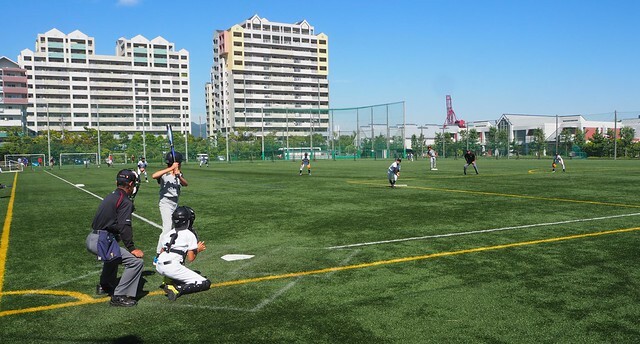 A beautiful day for baseball on Rokko Island. Watching my son play has given me immense pleasure. It is better than playing myself and I am happy that he is experiencing interscholastic sport which game me much pleasure during my schooling. Basketball season is next up, already starting next week.